Over the last few posts, we've covered creating a proposal binder, organizing your proposal team, and planning your draft process. After these preparations, you're almost ready to start writing. Before the writing begins, you'll need to do one more thing, which is to create a framework for the proposal. One of the pillars of your framework should be a template to collect and define acronyms and abbreviations. For the benefit of the other writers, and particularly the proposal's reviewers, it is essential to collect and define abbreviations. Unless the writers define their abbreviations consistently, the proposal can quickly become difficult to read. This is especially true if a proposal has multiple writers representing different disciplines and using specialized terminology. Defining abbreviations within the body of the proposal is the first step and something each writer should do during the writing process. Example: "Our latest achievement is a new Training-of-Trainers (ToT) curriculum." Defining abbreviations within the proposal is one part of the process. The next step is to collect the acronyms and abbreviations into a table for easy reference. Ideally, the proposal's writers will define their terminology as they write and also add their abbreviations to a Word table or an Excel spreadsheet designed for the purpose. The table should organize the abbreviations in alphabetical order and list the definitions. To reduce the amount of work required to assemble the final draft, it helps to create the abbreviations template in the form you would like it to appear in the final proposal. For ease of reference, add the table to the front of the draft proposal. Later, when you assemble the final draft of the proposal for submission, the list of abbreviations can be inserted after the table of contents. An abbreviation is a shortened version of a word or phrase. There is more than one way to abbreviate, and this is where acronyms and initialisms enter. Your proposal will probably include both acronyms and initialisms. While they serve a similar purpose of shortening a word or phrase, they are different. An acronym is made up of the initial letters of a name or phrase. As an example, one acronym you may be familiar with is HIPAA, which stands for Health Insurance Portability and Accountability Act of 1996. Another well-known acronym is NASA, which is used far more frequently than the full name, the National Aeronautics and Space Administration. One of the distinguishing features of an acronym is that it is pronounced as if it were a word. We pronounce HIPAA as "HIP-AH" and NASA "NAS-AH" and not by their individual letters. An initialism is a shortened version of a word or phrase that is pronounced as a series of letters. Examples of well-known initialisms include CEO for Chief Executive Officer and NSF for the National Science Foundation. Initialisms often appear with periods, which help identify them as initialisms (U.S.A., U.K., etc.). Instead of the word "initialism," words pronounced as a series of letters are often referred to as abbreviations, although technically "abbreviation" is an umbrella term that covers both acronyms and initialisms. As far as your template is concerned, the distinctions between acronyms and initialisms won't matter because you'll be gathering them into a single list of abbreviations. Many people use the words acronyms and abbreviations interchangeably and title their list of abbreviations "acronyms." Labeling a list "acronyms," when it actually includes acronyms and initialisms, is a minor detail in the scheme of things, but it is more accurate to label the list by the general and inclusive term "abbreviations." Do You Need to Define Every Abbreviation? Sometimes you don't have to define every abbreviation. Whether you do or not depends on the style guide you use and the approach endorsed by your organization. Some organizations want all abbreviations and acronyms to be defined on first use, including familiar ones like "HIV" or "UNICEF." Other organizations believe some abbreviations, like NASA, are so well known, there is no reason to define them, and in fact, that doing so unnecessarily clutters the writing. Don't define well-known abbreviations such as IBM, ATM, Ph.D.
Don't define something that you know will be obvious to the reader. This point relates to the one above. The example offered by www.plainlanguage.gov is that if someone writes a letter to the Federal Aviation Administration (FAA), in its reply to the individual, the FAA does not need to define "FAA." This rule has an obvious application to proposals. If you are submitting a proposal to the Centers for Disease Control and Prevention (CDC), arguably you do not need to define CDC in your proposal or list of abbreviations. Don't use an abbreviation unless you have to. The Plain Language guidance is almost radical in its philosophy that writers should use only 2-3 abbreviations in a document. All other terms should be spelled out. They believe that, except for a few words or phrases that get used over and over again and are therefore worth abbreviating, most terms in a document are used so infrequently, it is not a burden to spell them out each time. Abbreviations are hard on the reader, so avoid them whenever possible. If you define an acronym on page two of your proposal, do you need to define it again when it appears on page 10? What about page 20? 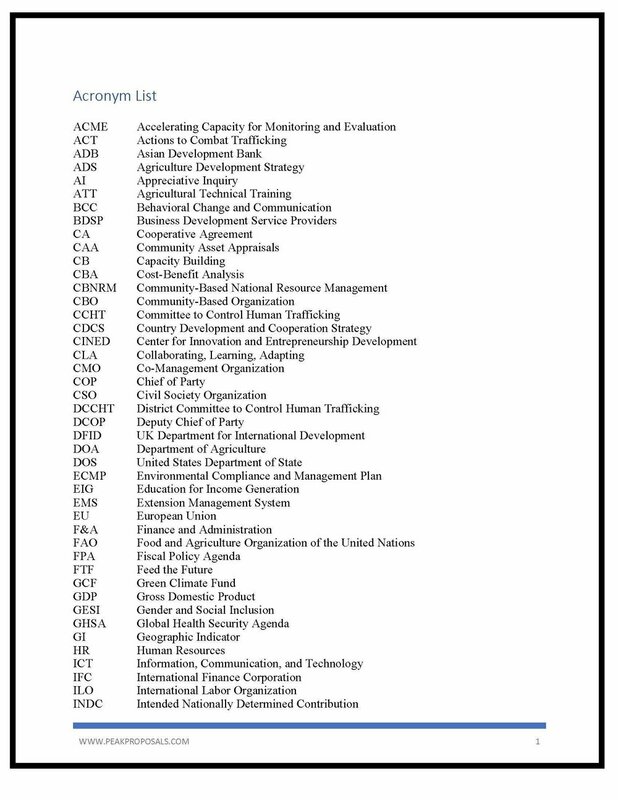 If you include a list of all abbreviations and acronyms at the front of your document, it is probably okay to define an acronym or abbreviation only on its first appearance. If you cannot include a consolidated list of acronyms and abbreviations in your proposal for whatever reason, you may want to define the term again if there are several pages of text separating the first and subsequent use. Want More Guidance on Abbreviations? If you would like to read more on the use of abbreviations, below are resources used for this post. Grammar Girl, "Abbreviations, Acronyms, and Initialisms"
Scribendi, "The Correct Use of Acronyms and Initialisms"
Another resource that can be very helpful when you encounter an unfamiliar acronym is Acronym Finder, a database of acronyms across multiple disciplines.